It’s that time again. You’ve received your orders and it’s time to get ready for a permanent change of duty station (PCS). You have two options. 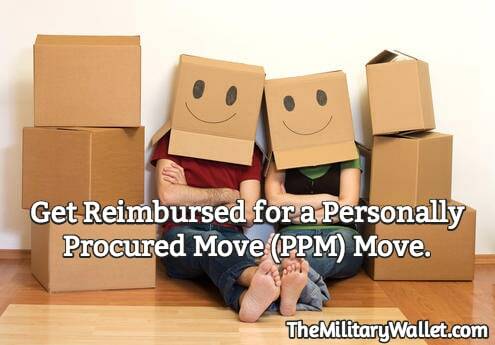 You can let the military take care of the arrangements, or you can handle a Personally Procured Move (PPM) yourself (what used to be known as a DITY move, or Do It Yourself move). Anyone who has to move, separate from the military, or retire under orders or make a PCS, Temporary Duty, or Temporary Additional Duty (TAD) move is eligible to handle a PPM. There are definitely some benefits to handling a PCS yourself. For example, you’re in charge of your belongings, and you don’t have to worry about reckless movers breaking your belongings. Even though it’s more of a physical and stressful move to do a PPM, you could actually profit off of your move. If you decide to handle a personally procured move, read the following carefully, to ensure that you receive full reimbursement for your time and efforts. Why Should I Make a PPM Move? With a PPM, you can receive reimbursement for 95% of what it would have cost the federal government to move you, even if it didn’t cost you that much to move. If you’re able to DIY much of your move and keep costs low, the difference between the actual costs of your move and your reimbursement is money in your pocket. With a PPM move, if your move meets the time and distance requirements, you also may be eligible to receive travel allowances for yourself and your family. It’s also nice to have complete control over your belongings. There are some unbelievable horror stories about military moves that will make you want to pack your belongings yourself. How to Make a PPM Move? DIY moves will only be reimbursed if your PPM move was officially authorized by the Personal Property Transportation Office. To receive authorization, you need to fill out all of the necessary forms, including the form DD 2278 which is the Application for DITY Move & Counseling Checklist. Make sure you get your approval form signed before making moving arrangements. Once you have written approval for your move, it’s up to you to arrange the actual packing and loading of your household goods. Those details are beyond the scope of this article, but you can find an excellent reference with downloadable checklists at The Ultimate PCS Guide to Packing Out. Since all costs you procure while making your PPM aren’t taxable, they will be deducted from your reimbursement to determine what your financial profit from the move will be because only the profit will be taxed. By keeping track of every expense, and keeping the receipts, you will be able to maximize your reimbursement. You only have 45 days following your completed move to submit a claim for reimbursement of your PPM allowance. So, as soon as you have your records in order, go back to the Personal Property Transportation Office to submit your claim. Any costs of moving that are greater than the government cost for moving will be at your own expense. For this reason, if you are thinking about making a PPM, make sure that can accomplish the move for less than a government arranged move. Military members may also file for reimbursement for En Route Travel costs using the DD Form 1351-2 Travel Voucher or Subvoucher (PDF). Service members completing a PCS within the Continental United States may also receive reimbursement for temporary lodging and meal expenses (TLE), up to $180 per day, to offset the costs of lodging during the move. This allowance covers both service members and their immediate family taking part in the move. Temporary Lodging Allowance is paid for up to 60 days for temporary lodging and meal expenses for service members and their family who are waiting for permanent housing in an overseas move. There is only limited authority for POV shipment within CONUS. Shipment within the CONUS is authorized only when medically unable to drive, homeport change, or not enough time to drive. If you decide that handling a PPM is the right move for your family, make sure to keep good records, handle all of the necessary paperwork and authorizations both before and after the move, and to submit your claim within 45 days of your completed move. Have you ever handled a PPM? Do you have any advice for service members who have never done a PPM for a PCS? My wife is AD Air Force and this is our first ever PCS…we are super nervous having never done this before. We are considering a PPM because we do not have much to move. Does anyone have advice for a first time PCS? She is in Texas and I live in California. We are still trying to figure out how it will work getting our belonging and myself to her new duty station in Ohio.